Samsung has been caught with their pants down in an attempt to create a buzz in Swedish online forums for their LED tv sets. A Swedish agency called the Viral Company has been posting comments and questions to numerous forums about the best LED tvs, pretending to be an ordinary consumer. With fake identities the Viral Company tried to get the word going in forums about gaming, movies, home electronics, outdoor life and so forth. But they did a major mistake when they added a smiley to the posts with the purpose of tracking conversations, since the URL for the smiley icon went to a domain name owned by the Viral Company (http://power.moltoman.com). So the little scam was brutally revealed, and here is the fun part – someone else is following in the footsteps of the Viral Company, calling them out as cheaters. 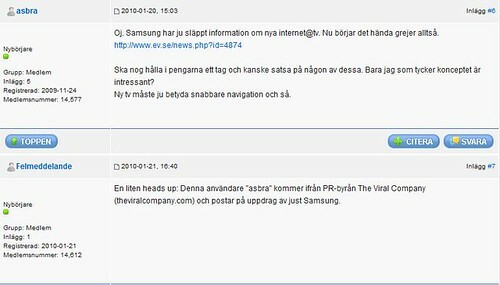 A user named “Felmeddelande” (Error message, in English) posts comments to the different forum threads explaining that these posts are done on behalf of Samsung, which in most cases are in breach of forum rules. If you do a Google search for http://power.moltoman.com/tracker/PMfegnEb/smile.gif (the image has now been taken down) or http://power.moltoman.com/tracker/ you get a long list of forum posts, almost all about LED tvs. The question now is, how much of these tactics did Samsung Sweden know about. If the campaign has been approved by Samsung then they are in desperate need of some rethinking in terms of social media strategy, because this campaign was doomed to backfire from the very start. It will also be interesting to see how they will handle this online crisis situation. Will they stay silent or will they address the issue? Hat tip to @pellet who blogged about this story he calls Samsung-gate, in Swedish this morning. See also Adland (in English). Update Feb 15: Adland has talked to Samsung about the matter. See more details here. Tags: samsung, viral, fake, tv. Ping.